Arvind Ramkrishna turns boxes into cars. 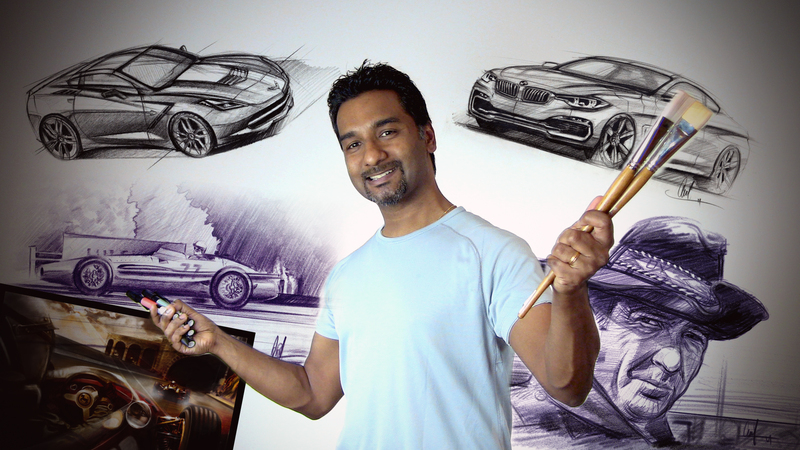 With a design skill set and an engineering background, he has mastered the art of digital Automotive Art. Read how. Arvind, how did you get started in painting and drawing? At school I was known as the classroom artist. I don't think I really cultivated the art until I went to college. My father (a distinguished professor) has always been enamoured with art and used to draw cartoons and create his own magazines. His youngest brother was phenomenal with pencil drawing in India and used to help guide me when I drew portraits. When I got to college, the reality set in about the importance of getting a decent job. I wanted to channel my art into something else and this is why I went into industrial design. It just seemed to be the natural progression to take something which is very creative in nature and then apply that beauty to something industrial. I then went to Purdue University and put a lot of thought into a different approach of not only combining industrial design with art, or making products beautiful, but also having enough technical background to help in the engineering process. It became more of a venture, something which was very process related to see how I could efficiently design something. When I graduated, I was lucky to join one of the few automotive interior companies that appreciated people with a design skill set and an engineering background. This position was called studio engineer and was the liaison that would help to realize the product designers vision, using some of their own design skill sets but then be able to communicate to the engineering team where that balance needed to take place. Coming from college, it was really a GREAT opportunity to get some experience in that field. From there, I delved into the studio engineering role and assured that skill set, but after a while I was really intrigued by a lot of my colleagues and their style of sketching. They had graduated at private art schools like The College for Creative Studies in Detroit Michigan (CCS). Even though I enjoyed the sketches, the kind of training being offered in the private design institutions was completely different from what I was used to at a public college. The kind of training you get from CCS was the sort of training back in the 50's and 60's. 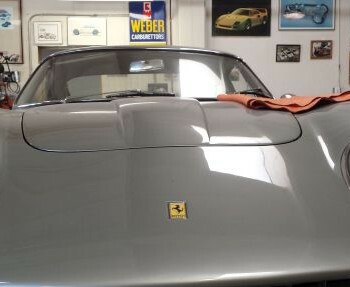 It's really focused on taking someone who has a particular drawing talent and ability and then refine it, harness that talent and mould it into automotive styling. It sounds very technical and application related. Yes, it's a very intense school with a vigorous training. They are really training you to be able to draw and ideate quickly. There is a kind of muscle memory which happens when you are putting out ten thousand sketches in the span of four years. Like the Bruce Lee quote "I fear not the man who has practiced 10,000 kicks once, but I fear the man who has practiced one kick 10,000 times." [Laughs], yes that was a great quote and I was intrigued by that. Something in me felt that I needed to push and test myself. I had an intellectual curiosity of what I would be capable of, if I really put my mind into it and applied enough focus. I wanted to see if my technique, execution and sketching could be more fluid. It was foreign to me but it kick started my passion back in 1999 to start to teach myself. When I moved to Detroit, Michigan, I was closer to CCS and enrolled in some courses to see what the curriculum was like. I took classes and it was indeed tough and every bit as difficult as people were talking about. But I did enjoy learning and I really wanted to see if I could progress and get better at it. I drove myself to continue on with the effort and practice in my basement for hours and hours. What was the topic of your sketches? Could it be anything? I started off with basics. Even though in college, we sketched a lot and drew our own concepts, I did find that the amount of time I spent on fundamentals was probably not enough. Drawing boxes and circles for hours is really tough and boring but this is why I teach this stuff now because I understand the real value of drawing basic shapes and perspective. When you are in college you are looking at the end game. You are not really looking at why certain things need to be done and that is part of the method of having teachers who can guide and direct that importance. You need to have the basic skill set right. Did you do that outside of the work you had to do for your education? Absolutely. Although Purdue was a really good school for getting a well rounded education, it's not the same as a private school which focuses on very active drawing. I bounced my studies with studio classes. It was tough because I had to perform at a level which still met commitments for the projects. So I was forced to ensure that I was outputting at a quality level. Whereas in CCS, everything is related to design. The average is extremely high in private art schools. Maintaining that level results in an output at the end of the year which is quite a bit higher. What really got me interested in drawing in general, was to see how I could refine my talent to a professional level. So it was an ultimate challenge for me. You said training for art is like a muscle memory and that you need to do a lot of practicing to keep in form. Do you need to keep that up every day, like a musician does? Yes, and I play the piano. So I can definitely relate to the musical portion of it and the necessity to practise. You can compare it to a person who always works out and builds up their strength. If that person were to lay off for a couple of weeks and start to lose their strength, there is still muscle memory and it would take them much less time to get back their strength. So you never really lose it, you get rusty. It takes much less time for you to build up that muscle memory and get to the level of sketching you were doing before. So the advantage of having such a background and skill set means that your output is also pretty high. You did a Ford GT supercar sketch video in just 9 minutes? That sketch took me about thirty five minutes from start to finish but I edited it and compacted it for the video clip. I liked how you did that and showed the audience how it was done. What I would like people to understand is that when you engage in art or the act of drawing, it's really an intellectual process. People typically have this impression that people who go into art are naturally talented and although this is sometimes the case, I do believe that everybody has a certain level of creativity inside of them which they maybe haven't yet discovered. By training your brain the process of learning the perspective at the beginning, it essentially trains the analytical side of the brain and connects it with the creative side. At some point you start to develop both sides and are then really able to see things you normally wouldn't see or an engineer may not necessarily see because they can't visualize it in their head. They are more analytical and data related. When you start to practice drawing, you realize that the end result is really helping you in your complete problem solving. This is why when I was learning, I went back to learn the fundamentals. I enjoy giving my brain the exercise to go through those hardships because once you learn it, it stimulates your brain and enables you to take in more information and learn more things. Is that also how you pick the topics for your artwork? Yes. The topics for the artwork is again more of an exercise in understanding certain characteristics of the kind of emotion that I want to portray. One of my favourite artists who has influenced me is Tom Fritz. He has a unique ability to communicate the excitement, movement and saturation of the colours and also in getting the kind of edge lighting. He is just a master of lighting and in getting the emotion. It's not just the car, it's the way he communicates the sunrays, he's telling a story. Those are the kind of things I study and try to understand what it is about the paintings which really captivates the audience. Is it just the colour? Is it the movement of the tyres or in capturing that still motion? I really appreciate those details when I look at his paintings. Did you have a natural skill for lighting or is this something you had to learn? When you are looking at product design and you are part of the design process, you have to visually understand how light captures a product. You look at the harmony in the highlights, shape and the cast shadows and if it is eye catching. It's not the same as fine art. When people see something which has been painted, they will have an instant reaction. They either get it or they don't. With some artists you instantly see the emotion and the story behind it. For product design, people won't really understand why something looks good. They just know it works. It is the designers job to put together a package which the customer will appreciate. In certain instances, when you start to delve into the fine arts or when a product designer starts to learn about art, he can now start to connect the dots and how to enhance the product. I know the emotion I feel when I start to paint and add certain elements to my painting which is going to get a reaction. In your Monaco Grand Prix tunnel painting, you have some background which tells more of a story than your painting of the Porsche racing through the night. Do you want to tell more of a story with your artwork? Yes absolutely. An artist goes through various processes of solidifying their technique. The next progression is communicating a story where you get people to think. 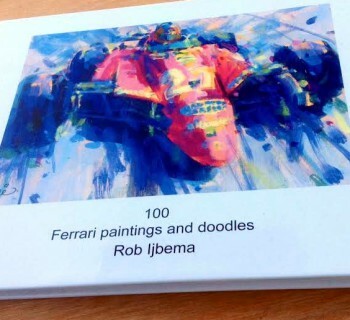 With my Monaco tunnel painting, I was trying to capture the intensity of the race by the sun reflecting off of the car and the reflection of the driver in the side view mirror. Once the basics and technical execution has been done, I can focus more on the story. Ultimately it's the story which connects with the audience. What is your technique? Do you use digital work for painting sketches? I sketch it out with prisma pencils after doing a lot of research on the web. I purchased the movie Grand Prix. It was visually stunning and this is where I actually got my idea for perspective which I could use for my Monaco painting. I took various things and made up a lot of the rest and used it as a foundation. I created the side of the mountains, the clouds and the car in front and recreated the reflection of the guy. I transferred my pencil drawing to photo shop and painted it digitally. Some of the things which I have learned from conceptual designers in California, is the practice of speed painting. How to communicate a sense of realism in my paintings without going into too much detail. You just need the essentials and that's what you see in the Road America Porsche painting. It took me an hour to do. There was no planning. When I went to the Road America race track, I snapped as many photos as I could and when I came back home, I looked at all the high contrast areas and the focus on colour, shape and lighting and that was it. I really focus on the shape. I try to get as much information onto the canvas as I can. I like your skills on how to explain this. Looking at your Road America Porsche painting, the background has a sort of cubism about it. I don't particularly aim for a style of painting which reflects cubism. I rationalize how I can communicate the image by focussing on just the shapes by those characteristics. What I am really doing is training my brain and developing my powers of observation as a designer or artist. It's about how good you are at seeing the world around you and being able to replicate that. How to break it down in simplistic terms so that the brain is able to comprehend the information without getting too technical. It's a process. Your brain can't take too much information at once. It has to learn by progression. When I was at college, I never really understood the value of drawing the boxes. How does the box turn into a car? But what I didn't really understand is that you are really training your brain to set up the perspective of your car. So if you are really good at drawing boxes and perspective, you can essentially start to carve the boxes in a simplistic way and then build on those shapes and let your mind go into it. 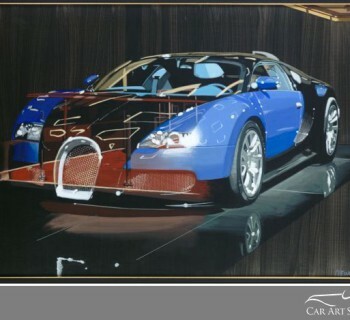 I do know artists who put a grid over the car photo. You don't? When you are developing as a beginner, you need to train your brain to comprehend the technique of replication. It's really about the power of observation. You want to use several techniques. How well are you able to draw those particular shapes and curves within the confines of those grids. Your visual spatial ability is what you are training there. At some point you are able to draw and replicate the car without the grid because you are able to have a good sense of measurement. This is what they teach at college. You are taught to draw fast and fluidly while getting the excitement into your sketch. Using a grid format is a very viable way. You are teaching yourself where the proportions are. What made you take the decision to share your knowledge with other artists through your teaching program. After I started to get into the technique of drawing and understanding what it was about and how to internally rationalize that process, the journey began. We are all constantly learning. It's about self improvement. There is always someone better than you. Based on that, there is always room for improvement to enhance your self confidence. A lot of people may feel they do not have a particular talent. When I created this DVD set, I wanted to help people discover their talent. If people are given the essential tools and they work hard, they achieve results. Input equals output. I feel that if I can teach people in an inspirational way and give them the insight to discover their talent and see progress, it really helps boost their self confidence. It really doesn't matter if it's about drawing or anything else. It's about making yourself better as a person and that's what the DVD is essentially about. I call it 'The Four D's to success. Drive, Determination, Discipline and Draw. The Four D's are what you need to be good at anything to keep you on track and reach your end goal. The DVD was really an experiment on trying to accomplish something and help other people to discover something about themselves that they didn't know existed. How is it being received in the market? It's great. We have 24 reviews which have all been predominantly 5 star reviews. Some people have shared with me that although they have always been interested in drawing as a child, they have never been into car design. Then they bought the DVD set and can't believe they have accomplished such progress. When you hear things like that, it's awesome. To me it's one more person who is closer to pursuing a dream or just to get better. It's been great. Now we are looking at the next stage of broadening the scope. Not just drawing automobiles or cars but the value and benefits of drawing in general. What is your dream. Where do you see yourself in 5 or 10 years from now? That's a very difficult question to answer. I am very passionate about it but I think my dream is to really take something that is a bit more main stream and develop it in different kinds of learning techniques where people are able to get some pretty quick results. Also to hopefully create more tools, tutorials and maybe a library of a self development program. I am part of Toastmasters and do talks. I still work in the industry and I enjoy it. So I also advise my fellow engineers of the value of being creative. I enjoy speaking and trying to inspire people. Now I am taking all these skill sets and trying to put it together in a package to see how I can influence and give back to the public and help people to realize certain things. I am excited with the developments but part of that is talking to other professionals and designers and getting their feedback on what struggles they have and how we can help them be more efficient. To think outside the box a bit more and how the process of drawing helps with a lot of those things. Getting back to your own artwork. If people are interested, is your work for sale? Yes, the website is: www.emotiveart.zenfolio.com. The emotive art is awesome. It's printed on metallic paper. It has this beautiful sheen that is on the photo paper which really brings it to life with a 3D effect. Is the advantage of having digital images that you can blow up the size? I am very careful with that. Part of the reason why the paintings take a long time is that I paint them in actual size. I go 300 dpi and paint them 16 x 24 so that I can reduce them and maintain fidelity and accuracy. But even increasing them with still produce a decent size print without any loss of detail or extra pixilation. They take longer to do but at least the end result is very good for the person purchasing them because they are getting something which is high quality and scalable in size. It's my pleasure Marcel. I really enjoyed it. It was like talking to a friend. See and read more on Arvind Ramkrishna's website www.drivenmavens.com or buy his DVD's.